Do you think you know Hackers ? 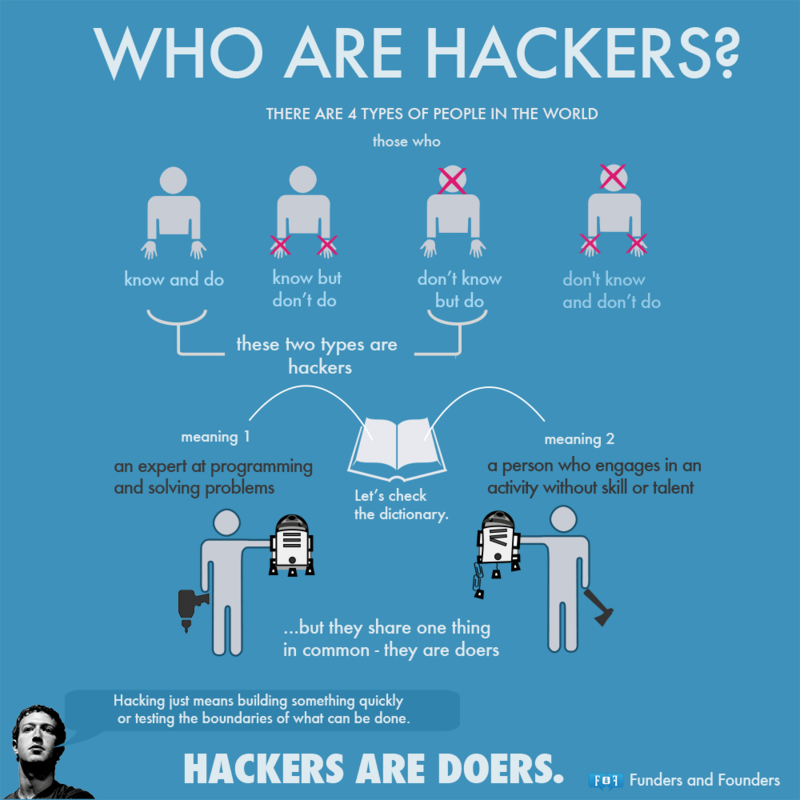 Check this out, an awesome InforGraph about who Hackers truly are ! Look at all the Developed countries, or india, china, some of the fastest developing countries… When they were reaching that level, one of the main strategies they used was empowering their own Innovators and supporting innovations every step of the way ! but here in Sri Lanka, Innovators are being ignored, innovations are being thrown to the garbage pit ! lol ! Way to go, the so called miracle of Asia ! Another ignored, unsung, and wasted Innovator in Sri Lanka, the same usual tragedy which every single Inventor in our country goes through… SIGH ! If you want to be First, Unique, Move ahead, be the Success, before everyone else… Then stop following others, going through the same path, the safe path, copying others, seeking for help, trying to put down others…. instead, Make your own way, your own path, take the unsafe path, the path no one has taken before, the path everyone is scared of, everyone has ignored… Then you will achieve it ! Someday sooner or later ! That is where the problem is, we were taught not to share and be selfish, ever since our childhood by our parents and teachers, which would make us success is now a total joke ! Photography Enthusiast ? Amateur Photographer ? or anyone who seeks for Photography or photographers ? Having too much trouble going through hundreds of photos and albums ? searching for photography pages ? too much time waste ? A Centralized portal for viewing all Sri Lankan Photography. View all Sri Lankan Photography that are published on facebook in one single place, right in-front of your finger tips. There are loads of Photographers who has published their amazing photographs online on the biggest Social Media Network, facebook, but there is still no one place to access all those photography. Therefore we came up with this simple solution, bringing all Sri Lankan Photography that are published on facebook to a one place, giving an ultimate experience to the user. With “Sri Lankan Photography”, we are empowering talented Sri Lankan Photographers to reach more audience easily and quickly and for the User, we are bringing a stunning ultimate experience for you to view all Sri Lankan Photography published on Facebook, right from your finger tips. Are you ready for the ultimate experience ? Are you preparing for one of the most special events of your life, your Wedding ? The moment that you start a new life with your loving lifelong partner ? or Are you a Wedding Planner ? or a Wedding Photography enthusiast ? Then you must certainly be looking for Wedding Photographers and their Photography ! Sri Lankan Wedding Photography – A Centralized portal for Viewing and Showcasing all Sri Lankan Wedding Photography in one single place, right in-front of your finger tips. The one and only Sri Lankan Wedding Photography App in Windows Marketplace ! Empty your mind, be formless, shapeless – like water. Now you put water in a cup, it becomes the cup; You put water into a bottle it becomes the bottle; You put it in a teapot it becomes the teapot. Now water can flow or it can crash. Be water, my friend ! Coding is today’s language of creativity. Are you a Windows Phone User or an Enthusiast from Sri Lanka ? then Join our community, where we all come together and share everything related to Windows Phones, Ask any questions, connect with other Windows Phone Users from Sri Lanka. We bring you latest News and Content about Windows Phones. Specially we are bringing you all the latest prices for Available Windows Phones in Sri Lanka, along with special offers, promotions and etc in Local Stores !